The month between Thanksgiving and Christmas accounts for as much as 40 percent of annual sales for some retailers. Their challenge is to turn those holiday shoppers into loyal year-round customers. "You create return customers by creating the most amazing experience -- not just a good first impression, but a phenomenal last impression," says Shep Hyken, a customer-service expert and author of The Cult of the Customer (Wiley, 2009). Clerks should give customers business cards that include a cell phone number where they can be reached, even on their day off, he recommends. And then there's the follow-up, which can include a handwritten thank-you note and emails alerting the customer to sales and special events. "It's not a transaction; it's an interaction," Hyken says. "Anyone can ring up something a customer hands them and let him walk out the door. The goal is to create loyalty, which is about a customer having confidence and a comfort level with you." Here are three examples of how small-business owners are turning holiday traffic into higher sales all year long. 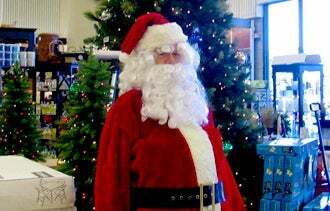 Griffin Ace Hardware's customer appreciation event features 20 percent discounts, photos with Santa, and product demonstrations and giveaways. 1. Create a superior in-store experience. Griffin Ace Hardware, which has two stores in San Diego and one in Santa Ana, Calif., makes being "helpful" its primary marketing message year-round. During the holidays, this means recognizing that people are in a rush and adding extra staff to ensure adequate attention on the floor and minimal waiting time at checkout. In addition, employees are trained to recognize harried customers and try to get them on their way as quickly as possible. "Mainly it is body language," says Stacey Griffin Jess, whose family founded the business in 1953. "We are watching to see if the customer is walking fast, talking fast and seems in a hurry." The company, whose annual sales are estimated to be in the $7 million range, gets two large deliveries a week during the holidays to ensure that it has enough merchandise on hand and doesn’t disappoint customers. And it hosts a customer appreciation night the first week of December, with 20 percent discounts on most items, photos with Santa for the kids, and product demonstrations and giveaways. "This evening allows us to showcase our home décor and seasonal products, but also gives customers a chance to see the other products and services we offer," says Griffin Jess. "We try to give them the helpful experience that will bring them back." Griffin Ace has attracted nearly 70,000 Ace Rewards program members, and it receives nearly twice the usual number of rewards applications during the holidays. Maureen Bay, founder of Gem of an Idea, believes in following up with personalized cards and invititations, including the following, pictured below. 2. Keep in touch throughout the year. 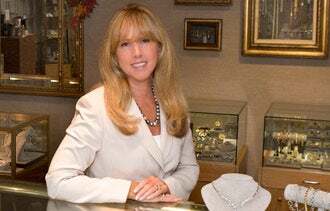 Gem of an Idea, an upscale jewelry retailer based in Fair Haven, N.J., generates about 40 percent of its $650,000 annual revenue in the last quarter, and most of that in the last six weeks, says founder Maureen Bay. She takes advantage of the increased traffic, collecting as much customer information as possible, including street address, email address and birth date. She also asks for a "wish list" and product preferences, so she can follow up with suggestions -- or even a phone call -- when she gets certain items in stock. "When the customer comes in to make a purchase or repair,” Bay says, "we ask them, 'Can we put you on our birthday list?' Who doesn't like to get a birthday card on their birthday?" That card is hand-addressed in gold ink and personalized inside, offering a 20 percent discount on any item in the store during the birthday month. Bay mails nearly 4,000 cards a year, using high-quality paper and first-class postage. She also mails an elegant holiday postcard by first- class mail highlighting a certain holiday collection. "People don't just throw it away if you present them with something well done, and it carries a message worth paying attention to," she says, noting that about 25 percent of people use the birthday discount. "It's necessary to remind customers that you are there." Retaining first-time holiday customers is about exceeding expectations, says Fabian Kaempfer, cofounder and CEO of Long Island City, N.Y.-based Chocomize.com, where customers can create their own chocolate bars. For example, the website shows an estimated delivery time of four business days, yet 80 percent of orders arrive in one to two business days. The company also adds a free gift to all orders – anything from sample-size chocolate bars to hot chocolate on a spoon – which costs it about 50 cents per gift but creates customer goodwill and repeat business. On average, Kaempfer says, 32 percent of first-time customers order again at least once within the next 12 months. “People are positively surprised and more inclined to share their great experience on social media channels and with their friends through word of mouth,” says Kaempfer, whose company has annual revenues just over $1 million. For example, Chocomize.com has 32,000 likes on Facebook, where it posts specials and contests.